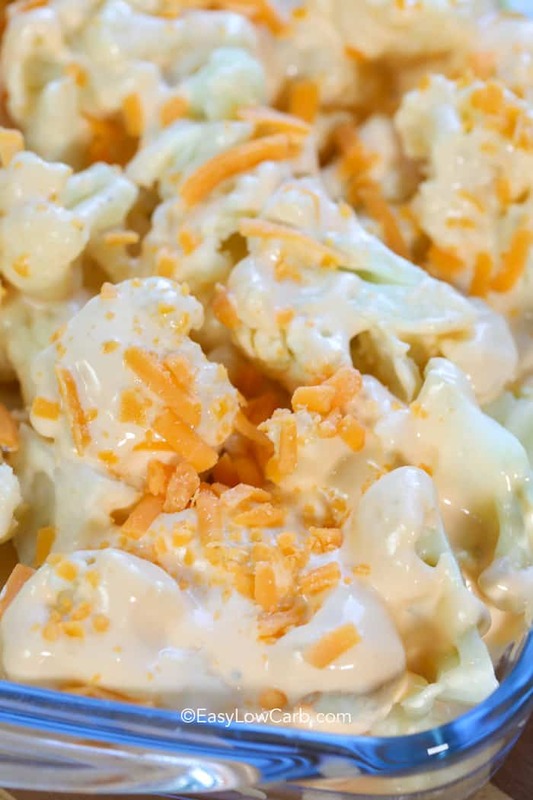 Nothing says low carb comfort food like this cauliflower with cheese sauce. It’s such an easy snack that even the kids will not be able to get enough of it! Serve it as a side with your favorite mains like Pork Tenderloin with Creamy Dijon Sauce or enjoy it as an appetizer on its own! Now that cauliflower has become the vegan, vegetarian, paleo and KETO sweetheart of the century, there are dozens and dozens of new ways to prepare this veggie powerhouse. This roasted version is the simplest out there and can be used so many different ways! Slice into ‘steaks’ and roast, or season and roast the entire head and crumble of bite-sized pieces for a salad or soup topping! Any way you ‘slice’ it, roasting cauliflower is the easy, tasty way to go! There’s no doubt that cauliflower can stand alone in any variety of preparations. But roasting cauliflower caramelizes the outside while keeping the inside smooth and creamy! Try serving cauliflower in cheese sauce over baked chicken breasts for a fancy presentation. 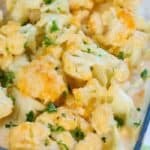 Try the cauliflower cheese sauce over zucchini or any other keto veggies you happen to have on hand. You’ll definitely find a new family favorite with added veggies and no complaints! 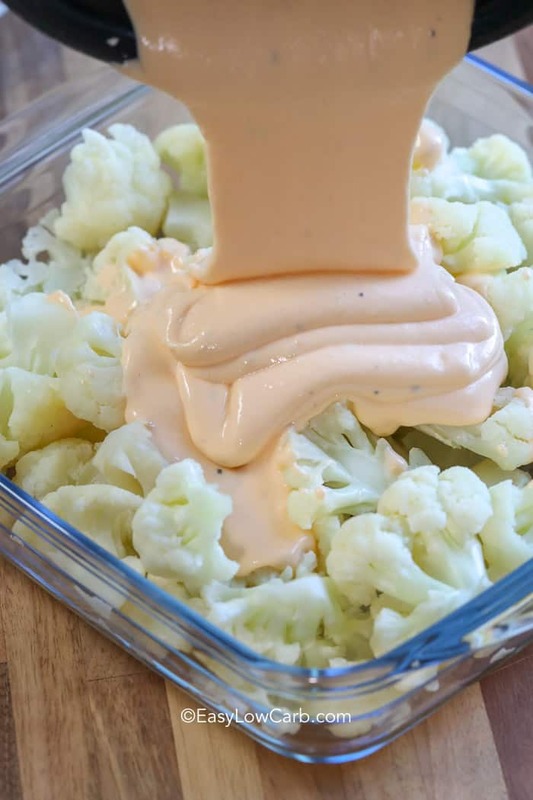 This quick cheese sauce for cauliflower is so easy to whip up, it’ll be on the menu for ALL the vegetables! The prep is super easy, just melt everything together on low heat and keep stirring until everything’s incorporated. Make sure the heat is kept on low. If the element temperature is too high, you will wind up with a grainy or split cheese sauce! The best way to avoid a grainy cheese sauce is to use full-fat cheese and cream. Grating cheese and mixing with a little cornstarch will keep it from overcooking and help it stay smooth and elastic while it melts. If the sauce gets grainy, simply lower the heat, add a little more cream and continue to mix until the grainy texture melts away! 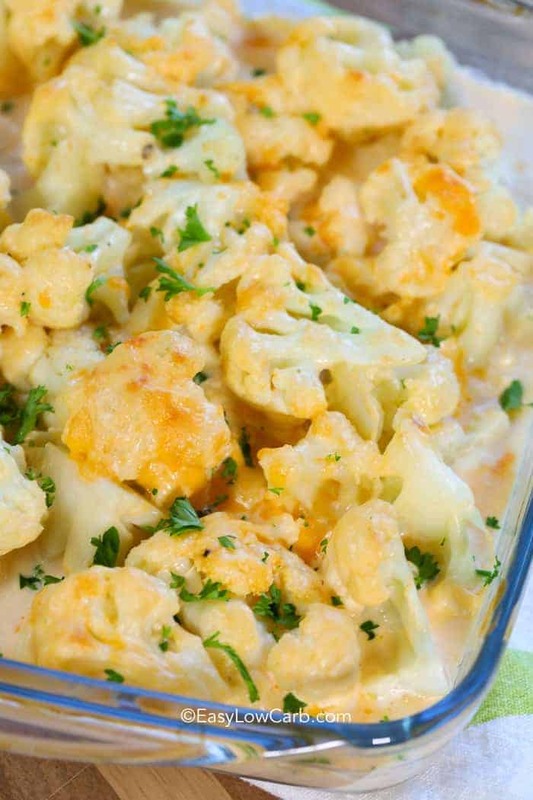 Cauliflower with cheese sauce lends itself to a variety of flavors. Don’t be afraid to add hot sauce, dijon mustard, or even mix-ins like chopped sundried tomatoes, black olives or herbs like tarragon or basil. As versatile as this recipe is, it’ll be impossible to run out of great ideas! Winning! 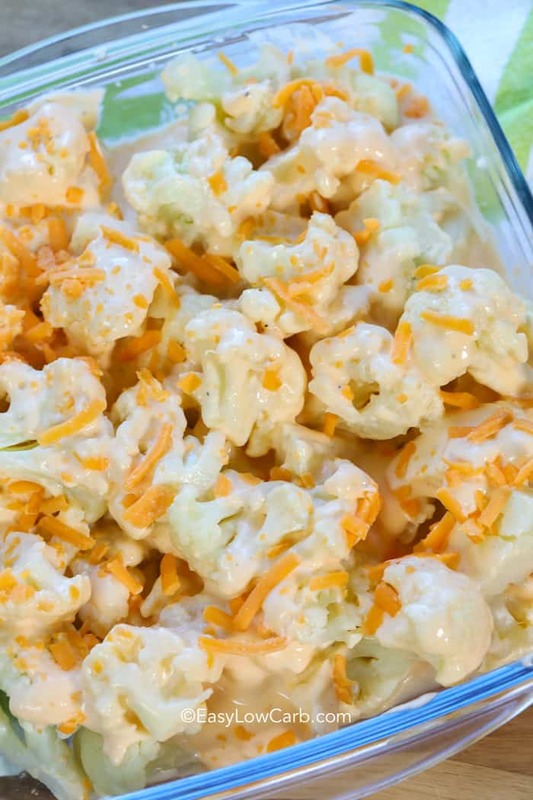 Nothing says low carb comfort food like this cauliflower with cheese sauce. Cut cauliflower into bite sized pieces. Boil 4-5 minutes or until tender crisp. Place in a strainer and drain very well. Add heavy cream, cream cheese and butter to a saucepan and stir over medium heat until smooth and cream cheese is melted. Add seasonings, bring to a boil and let boil 2 minutes while whisking. Remove from heat, stir in parmesan and 1 1/4 cups cheddar cheese. Place in a 9x9 baking pan and top with remaining cheddar cheese. Bake 20-25 minutes or until golden.